In 1633, Galileo Galilei was convicted on “vehement suspicion of heresy” by the Inquisition for his assertions that Earth revolves around the sun. Initially, Galileo was issued a prison sentence, but later he was commuted to house arrest, under which he lived for the last nine years of his life. But this groundbreaking scientist was actually fortunate since twenty years prior he had a different close shave with the Catholic Church that almost resulted in being burned at the stake. However, he was freed of all charges thanks to a letter he wrote to a colleague which presented his ‘heretic’ views more lightheartedly. Almost 400 years later, a new investigation has revealed that Galileo himself had doctored this letter in order to avoid prosecution. The 1613 letter that Galileo wrote to mathematician Benedetto Castelli is famous among scholars because it marks the date when the scientist started his skirmishes with the Catholic church. In it, Galileo presents evidence and shows support for Polish astronomer Nicolaus Copernicus’ 1543 theory of a Sun-centered universe. Copies of the letter were widely distributed, and Galileo found himself in hot water two years later when a friar by the name of Niccolò Lorini forwarded a copy to the Inquisition in Rome. The authorities there were not happy at all. Later, Galileo wrote to a cleric in Rome with whom he had a personal relationship, claiming that the letter in the possession of the church was doctored by ignorant people of bad faith. 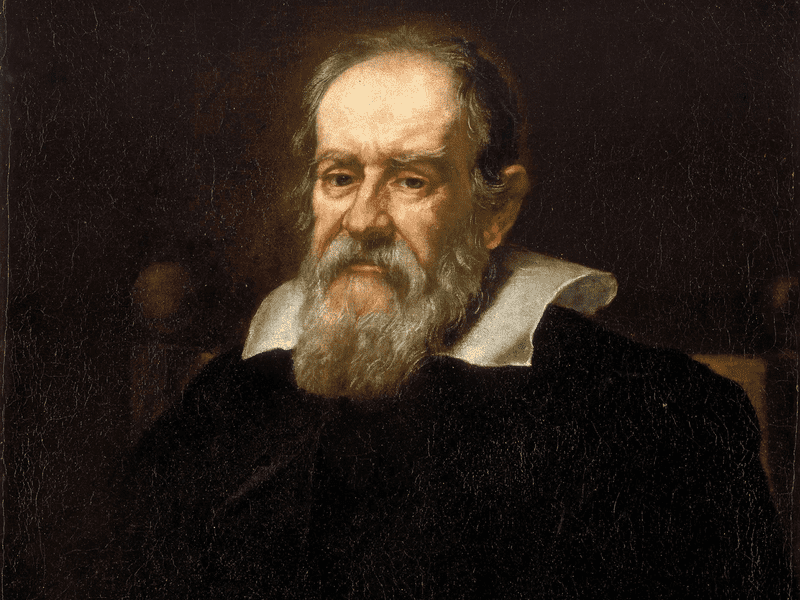 He included what Galileo claimed to be the original letter he sent to Castelli, which contained far less inflammatory language and much more ambiguous wording. And, this time, it seemed like the Catholic church believed his side of the story since Galileo was pardoned. The incriminating version of the letter is held at the Vatican Secret Archives while copies of the letter forwarded by Galileo to Rome exist in more than a dozen collections. Scholars have always been confused by this particular episode in Galileo’s life. 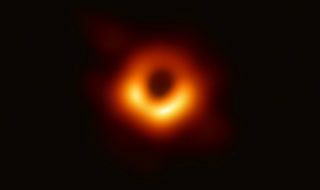 Who were the people trying to incriminate the Italian physicist? Did Galileo actually pull an elaborate hoax in order to save his own hide? What really happened? In his original letter, Galileo criticized the church but later used softer language. Credit: The Royal Society. The truth was revealed, as it often happens in such situations, completely by chance. In early August 2018, Salvatore Ricciardo, a science historian at the University of Bergamo in Italy, was visiting the Royal Society archives during his last day there when something caught his eye. The document he came across was the original letter Galileo sent to Castelli, filed under a wrong date. 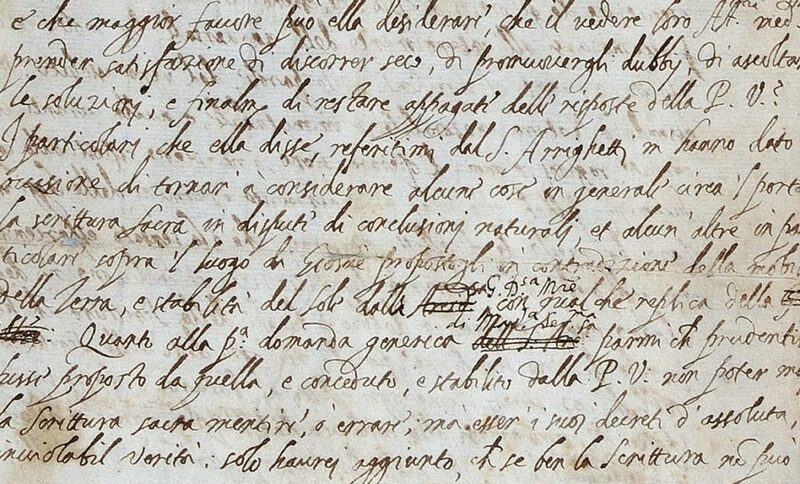 What Ricciardo saw was unbelievable — Galileo’s own handwriting, alongside crossed-out words and new annotations. “Beneath its scratchings-out and amendments, the signed copy discovered by Ricciardo shows Galileo’s original wording — and it is the same as in the Lorini copy. The changes are telling. In one case, Galileo referred to certain propositions in the Bible as “false if one goes by the literal meaning of the words”. He crossed through the word “false”, and replaced it with “look different from the truth”. In another section, he changed his reference to the Scriptures “concealing” its most basic dogmas, to the weaker “veiling,” wrote Allison Abott for Nature News, who first reported the story. Later, experts compared the handwriting in the letter to other documents written by the scientist, confirming that the document is authentic. So, it seems like a 400-year-old mystery is finally solved: Galileo really doctored his own letter in order to avoid prosecution. He had very good reasons to do it, too. In 1600, Rome ordered that Dominican friar and mathematician Giordano Bruno be burned to the stake for supporting and extending the Copernican model. “Strange as it might seem, it has gone unnoticed for centuries, as if it were transparent,” said Giudice. 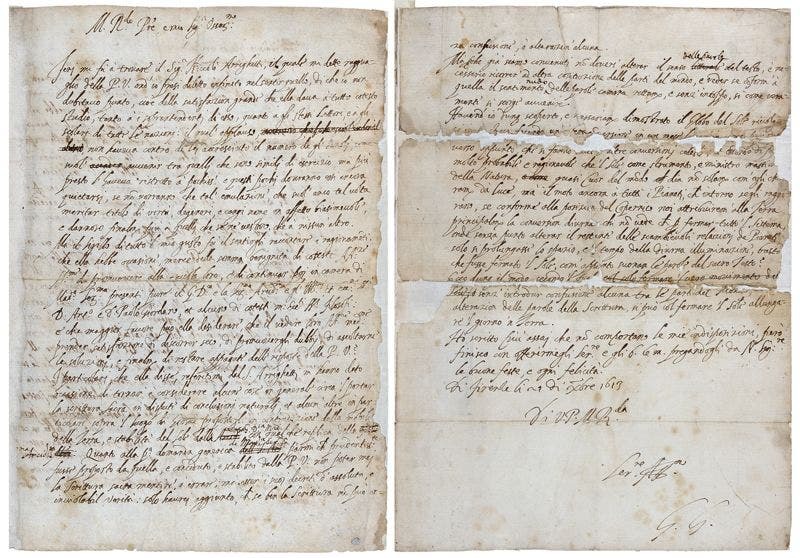 The first and last page of the letter Galileo sent to Benedetto Castelli, which shows the famous “G. G.” signature. Credit: The Royal Society. Strange indeed for the letter had been in the hand of the Royal Society for more than 250 years. Now, historians are trying to backtrack the letter — they so far know that the letter has been with the Royal Society since at least the mid-19th century, possibly even a century earlier. Who knows what else they might find if they keep digging?